Are you having a party for a child? If so, you will need party rentals for the party. Children of all ages love to have their birthday parties with their close family members and friends from school and other extracurricular activities. Unfortunately, we all know how difficult arranging a big children’s party can be. To help you do it, this article will help you decide on party rentals and other essentials for the big day. Read on to learn more. Figure out how many kids and other adults will be at the party, and go from there. Once you have a rough idea about how many people will be attending, you can start renting. If the party will be outdoors, you will definitely need a party tent. This is just always a good idea, because it might rain (or snow! ), or the sun might be very harsh on the day of the party, and a tent will not only be a great backup for bad weather, but it will be a place of refuge for those who do not want to participate in a specific activity or game. Next you need to rent party activities for the children. One great activity that pretty much all kids love is the bouncy house. A bouncy house (or bouncy castle as it is sometimes called), is a giant blow up house or castle that kids can get inside and jump all around in. It is completely safe and super fun for kids of all ages. If kids are below the age of five, however, they may need to be supervised by an adult. And of course, children who are older (in their teens or more) and adults should not go in the bouncy castle and bounce as it is not designed for them. 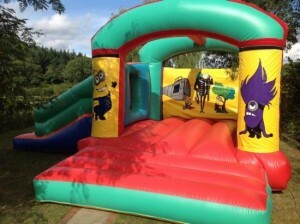 You can rent different sizes and types of bouncy houses for parties, just make sure to do so far in advance. Another rental that kids love is a chocolate fountain. This is a great dessert for kids who love chocolate. Dip angel food cake, strawberries, or other fruits or desserts into the chocolate fountain, and have a ball. Finally, make sure you are checking in with your child on everything you do to plan for the party. After all, this is his or her big day, so make it their own. Ask about themes, flavor of cake and ice cream, type of bouncy house, entertainment, food, music, etc. Make sure that your child is happy, and the day will go smoothly.